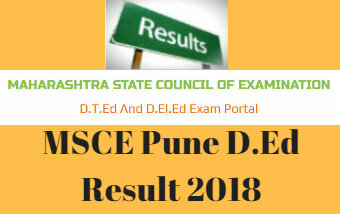 The Office of the Controller of Examinations, Maharashtra State Council of Examination (MSCE), Pune, may announce in the First Week of September 2018 the Results for Diploma in Teaching Education / Diploma in Elementary Education (First Year) Examinations conducted in June 2018. The Office of the Controller of Examinations will declare the Results for D.T.Ed. and D.El.Ed. Part I. The Results for Diploma in Teaching Education and Diploma in Elementary Education declared Institute-wise will be published on the Official Website for the ready reference of the Students who appeared in the fore-cited Examinations. Even as we would display on our Website Maharashtra State Council of Examination Communiqué in regards to Announcement of the Results for both Diploma in Teaching Education and Diploma in Elementary Education, yet we would like to advise the Students Institute-wise to continue logging into Maharashtra State Council of Examination Website for Timely Update. Wishing Here Good Luck for the Student! Press Click here on Maharashtra State Council of Examination Website to check out the D.El.Ed. / D.T.Ed. Examination, June 2018 Result.